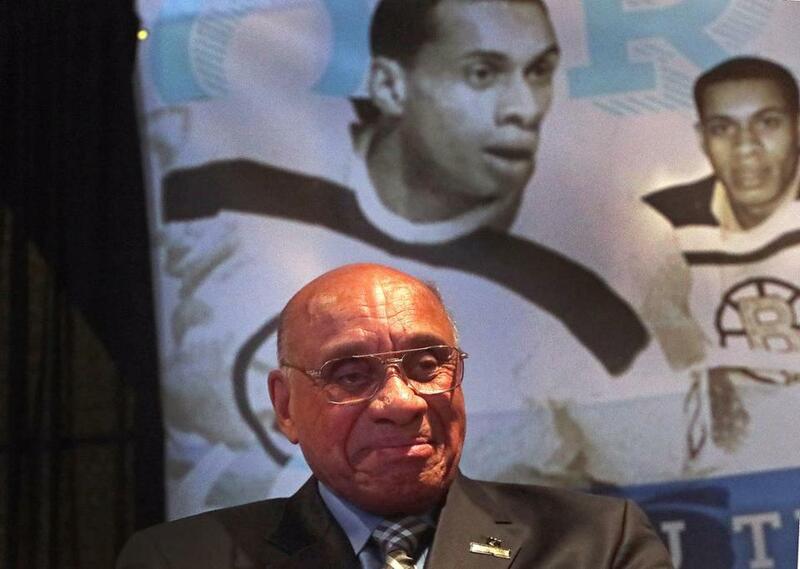 Willie O’Ree, the first black player in the NHL, was honored during a ceremony Wednesday at TD Garden at which it was announced that the Boston Parks and Recreation Department’s street hockey rink at Smith Field in AllstonBrighton was being named in honor of O’Ree. He’s known as the Jackie Robinson of hockey. In 1958, Willie O’Ree stepped onto the ice for the Boston Bruins, making history as the first black player in the NHL. Sixty years later, O’Ree is being honored for his historic accomplishment. Thursday will be celebrated as Willie O’Ree Day in Boston, and his name will grace a new street hockey rink in Allston. Mayor Martin J. Walsh, Boston Bruins CEO Charlie Jacobs, and NHL Commissioner Gary Bettman announced Wednesday at TD Garden that a rink at William F. Smith Field, scheduled to be completed this summer, will be named in O’Ree’s honor. Walsh said the new rink will be a place where kids of all backgrounds can have fun and learn how to play hockey. O’Ree, originally from New Brunswick, lost 95 percent of his vision in his right eye while playing hockey in the minor leagues, but continued to play professional hockey for more than 20 years. O’Ree also played for the Los Angeles Blades and San Diego Gulls. He was inducted into the New Brunswick Sports Hall of Fame in 1984 and received the Lester Patrick Award for outstanding service to hockey. In 1998, he was named the NHL’s Diversity Ambassador and created the “Hockey is for Everyone” campaign, an initiative that sent him across the country to work with 85,000 disadvantaged children and improve their hockey skills. On Wednesday, O’Ree said the city’s dialogue surrounding race in ice hockey has improved. While name-calling and racial slurs still make their way to the ice, O’Ree said he believes it just takes one person to make a change.